Like Alfred O, Gerald Trotter only had the one 45 on William Nunn’s Buffalo, NY Mo Do label – but it is a 45 that ought to be rather better appreciated than it is. 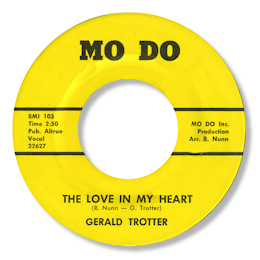 The Love In My Heart is taken at a dead slow pace, and the simple accompaniment from a rhythm section allow Gerald to stretch out to really good effect. And when the horns arrive in the bridge they make a strong impact. UPDATE ~ My great friend Greg Burgess has found a reference to a Gerald Trotter from Detroit - his website is here. Can anybody confirm that this artist is indeed the same guy as the Gerald Trotter I feature here? As ever I'm very grateful to Greg for his sharp eyes.